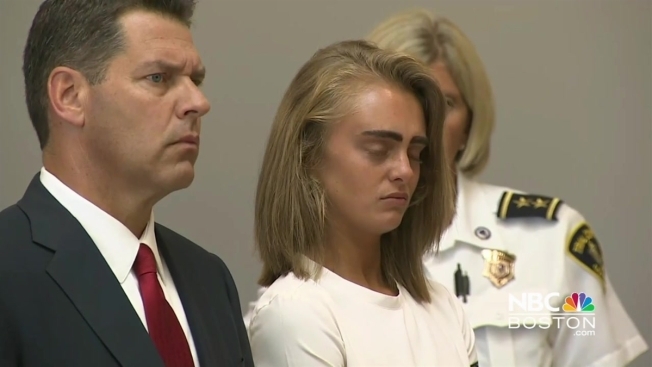 Michelle Carter, who was sentenced Thursday to two and a half years in prison for encouraging her boyfriend to kill himself, has found a supporter in another woman who faced public scrutiny during her own trial. Amanda Knox was convicted, then acquitted, of murder in the death of her roommate in Italy. On Friday, she penned an op-ed in The Los Angeles Times arguing against Carter's involuntary manslaughter conviction. Carter was convicted in June of encouraging 18-year-old Conrad Roy III's carbon monoxide poisoning death through a slew of text messages in July 2014, causing his death. She was 17 at the time. Knox wrote that "Carter may not be innocent in a moral or philosophical sense," but that she was wrongfully convicted. Knox went on to describe the similarities between Carter’s trial and her own experience defending herself in a courtroom. "When I was on trial for murder in Italy, the media tried to paint me as a 'femme fatale.' So it was with a sickening sense of déjà vu that I watched the prosecution attempt the same trick with Carter, whom they said coldly and calculatingly insinuated herself into Roy’s vulnerable consciousness," she wrote. Knox argued that Carter spent months trying to deter Roy from killing himself, noting that Carter was mentally ill herself and that she wasn't equipped to handle his own depression, and said that Roy’s suicide was ultimately his own choice. She concluded that Roy had needed sympathy and help, and "Carter deserves the same sympathy and help now."